Read our review of Christmas In Color from 2015! A favorite holiday attraction is returning to Utah this November for its second season. Christmas in Color will open to the public November 18, 2016 and run through December 31, 2016. The mile-long drive-through light and music display will feature one million led lights synchronized to favorite holiday tunes. Watch a short video of Christmas In Color 2015 in Kearns. 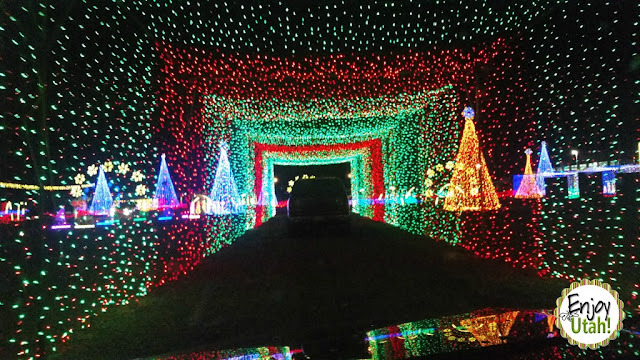 Visitors will enjoy the vibrant displays from the comfort of their own cars as they travel through glowing tunnels and passed fields of twinkling lights. Attendees tune their radios to a local channel upon entering the exhibit to watch the lights dance in coordination to the music. Last year, the popular display in Kearns, Utah drew tens of thousands of people, selling out on most nights. Organizers have decided to open a second location this year in Provo, Utah. Kearns, Utah located directly next to the Olympic Oval on Ed Mayne Street. Provo, Utah located at 4400 Center Street. About Christmas in Color: Christmas in Color is owned and operated by Utah’s popular Ice Castles, LLC and Holdman Lighting. In 2006, co-founder, Richard Holdman, created an animated Christmas display on his house and backed up traffic for 2 miles as thousands drove by to watch. A YouTube video of the home display garnered well over 20 million views in a couple of months. Christmas in Color continues this tradition of bringing joy and happiness to families throughout Utah during the Christmas season.